Axis Labs Creatine Ethyl Ester - The Power Of Creatine Multiplied! On sale now! 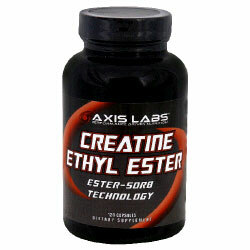 Axis Labs Creatine Ethyl Ester Retail Price $24.95 Your Price $14.97 SAVE SAVE SAVE!!! Details: Dietary supplement. Ester-Sorb Technology. You may already know that creatine increases ATP (adenosine triphosphate), the body's source of intramuscular strength. You may also know that dealing with creatine is a real pain. Loading, cramping, bloating - Creatine Ethyl Ester HCl is an exceptionally soluble form of creatine resulting in advanced absorption, increased bioavailability, and stability. Instead of saturating your system in creatine and hoping for absorption, Creatine Ethyl Ester HCl penetrates the muscle cell resulting in substantially more functional creatine. This means no more loading, bloating, cramping or dehydration. Most users notice a difference in their first dose. (These statements have not been evaluated by the FDA. This product is not intended to diagnose, treat, cure or prevent any disease). Manufactured with pride in the USA. Directions: As a dietary supplement, take 2-4 capsules twice daily. Workout Days: Take 2-4 capsules with 16 oz of water 15-30 minutes before workout. Take another 2-4 capsules with 16 oz water 15-30 minutes after workout. Non Workout Days: Take 2-4 capsules with 16 oz water with first meal. Take another 2-4 capsules with 16 oz water with meal 4-6 hours later. Store in a cool, dry place. Protect from heat, light, and moisture.